The Perfect Chair Colors and Dimensions - Human Touch Zero Anti Gravity Classic II ergonomic orthopedic recliner chair. The zero gravity position cradles your back and elevates your legs above your heart, which is the position that doctors recommend as the healthiest way to sit. Why Buy New? - The PC-410 / PC-420 (Manual) / PC-500 (Electric) / PC-510 (Electric) / PC-610 Omni-Motion Model Perfect Chairs include the full factory warranty. New Perfect Chairs are guaranteed to be factory fresh in the original factory box with the Full 3-year Manufacturer's Limited Warranty. 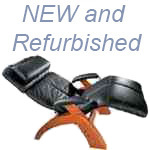 Refurbished PC-P, PC-6, PC-9 and PC-095 Perfect Chairs include a 90 Day Limited Parts Warranty and are in "as new" condition with Brand New Pad Sets. The Microsuede and Leather Pad Sets for the Perfect Chairs are not reconditioned. The Newest Series 2 Classic PC-500 Perfect Chair and Series 2 Classic PC-510 Perfect Chairs have the electric recline switch on the inside of the padded armrest for even easier control. 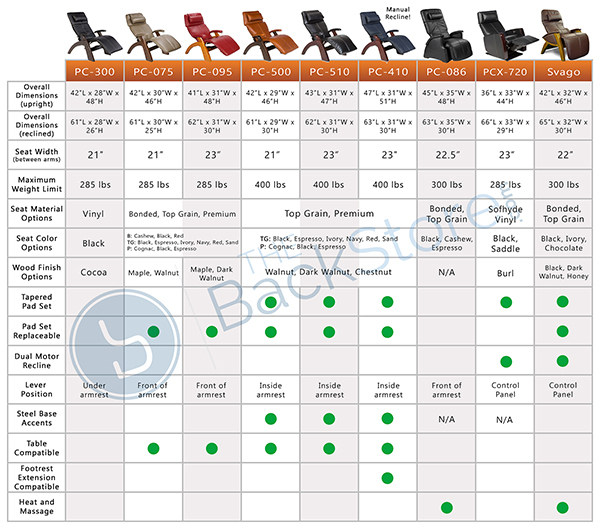 Buy a PCP or PC-6 / PC-9 / PC-095 Perfect Chair? - The PCP and PC-6 (Manual) / PC-9 (Electric) / PC-095 Model Perfect Chairs look exactly the same with the same dimensions, shape and size. The PC-6 / PC-9/ / PC-095 models have the ability to choose from different color Leather, Vinyl or Microsuede Pad sets with a choice of four different color wood bases. 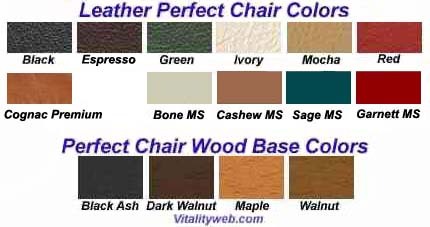 The PC-P2B Model Perfect Chairs are only available with Black Leather Pads / Maple wood base or Green Leather Pads / Walnut wood base (They are not interchangeable). New PC-9 / PC-095 Electric Chairs have the switch/controller on the armrest while the PC-W3G has the switch on the wood base. The PC-095 Electric Perfect Chair has an integrated Folding Footrest to allow for easier access in and out of the chair. The PC-6 (Manual) / PC-9 (Electric) / PC-095 (Electric) Model Perfect Chairs include an Large Air Bladder adjustable Lumbar/Headrest pillow and a small Lumbar/Headrest Pillow. The PC-6 is the only Perfect Chair that can add the new extending Footrest. All Perfect Chairs can add the matching back cover. The PCP Model Perfect Chairs include a Lumbar/Headrest pillow without the adjustable Air Bladder and can not add the extending Footrest but can add the optional matching back cover. All Perfect chairs are tested for up to 285lb users. Seat Back is 35". Inside seat width is 22.5"(between the armrests). Inside seat length is 18". Leg rest is 16" long. Seat height from floor is 18". Reclined Dim: 63"L x 31"W x 26"H -- Upright Dim: 48"L x 31"W x 48"H (43" L w/ folding footrest). The Armrest is approximately 24" from the floor. PC-075 inside seat width is 20.5"(between the armrests). 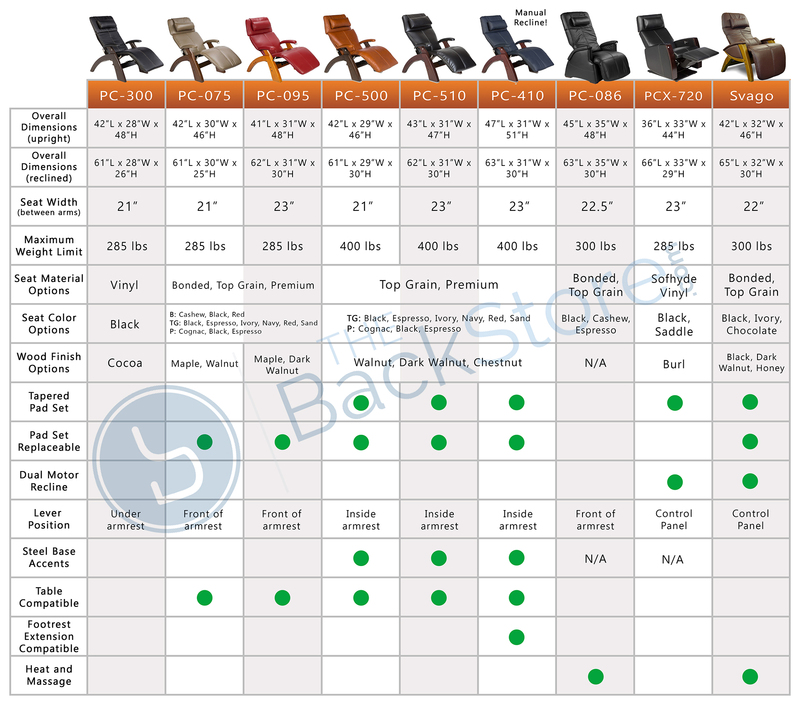 New Perfect Chair information and Pricing. Refurbished Perfect Chair Information and Pricing. Chairs are classified as factory refurbished for many reasons and we do not know why each one has been classified as such. We take great pride in offering refurbished products that are as close to "new" as the factory can make them. Our refurbished products have undergone extensive testing and evaluation to make them as close to new as possible. All massage mechanism components have been replaced with factory-fresh parts. The upholstery is factory-fresh. When necessary, scratched parts have been replaced with factory-fresh parts, yet some minor blemishes are unavoidable. You can view some of our customer's feedback on these quality factory refurbished chairs below. "Great chair!! I'm impressed!! It was "factory refurbished" but it seems new!!" - David S.
New and Factory Renewed Perfect Chairs include a 1 year limited warranty. The Chair Frame and Structure are covered for one year from the original date of purchase. Parts are covered for one year from the date of purchase. Optional Extended Warranties can be purchased for a In-Home Parts and Labor service warranty of 2 or 5 years from the invoice date. The warranty is not valid if the product has been misused or damaged in any way that is beyond the control of the manufacturer. The chair (or parts) will need to be returned to the manufacturer for service by technicians. Chairs are packed for shipping and require assembly. Detailed Warranty information. **FREE LOCAL WHITE GLOVE DELIVERY, SETUP, BOX REMOVAL and NO SALES TAX: Offer good on select NEW Perfect Zero Gravity Chairs only. Local delivery includes most San Diego areas for Delivery and setup. Outside of our local delivery area Basic Freight Ground curbside delivery is included (they will not bring the chair in the home or set it up). Outside of our Local Delivery area, white glove inside delivery and setup is only $125 for select new chair orders within the Continental US. Refurbished chairs do not include shipping or California Sales Tax (for California Orders only). Please see Shipping Information Page for more details.